Mootthings: 'Twas the season to be jolly. 'Twas the season to be jolly. Well not in our house; 'twas more the season to be achy, shivery, and grey in the face with a persistent cough and a slight temperature. Me - You're never going into work. C (manfully) - Oh, I'll be ok.
Me - But your arm's off! C - No it isn't; it's just a flesh wound. I've had worse. Needless to say two days later I woke up feeling and looking like the last turkey in the shop. We managed to drag ourselves out of bed long enough to stagger up the road and buy a Christmas tree (which looked very much like we felt), dump it in the back garden and go back to bed. The following day we just about made it to the supermarket, and then back to bed. On Christmas Eve, in between fits of coughing and bouts of shivering, we had to do all the housework and put the tree up. We just about managed to get the place straight before my brother arrived. "Sorry if I'm not very festive," he said as he came in, "only I've got flu". So the three of us sat about feeling sorry for ourselves while my brother's partner (who is a doctor) tutted and told us to take more drugs (mind you it might have been more worrying if she'd expressed any great interest: she's training to be a pathologist!). 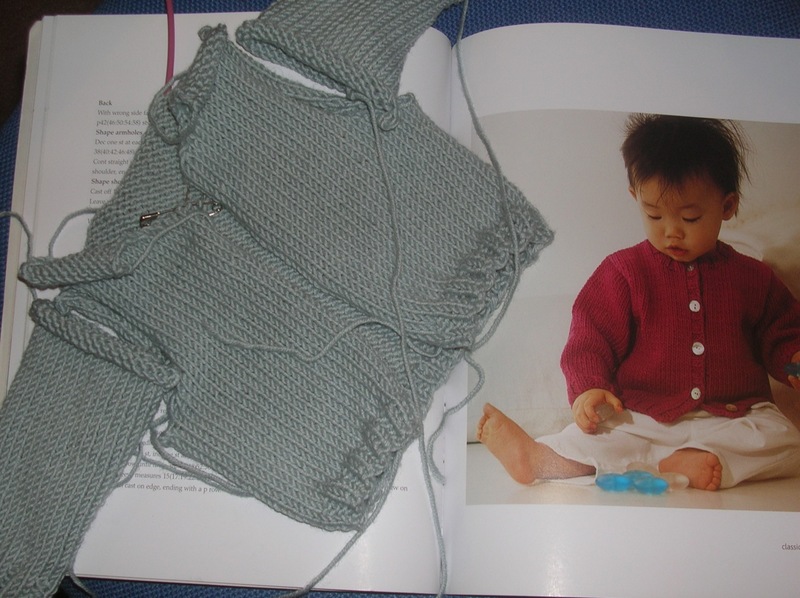 and (following Liz's example) to start a mini-version of the Debbie Bliss Classic Baby Cardigan, knitted on smaller needles so as to come out newborn size. I also finally relented and in response to C's piteous cries of "Aren't you going to make me something soon?" 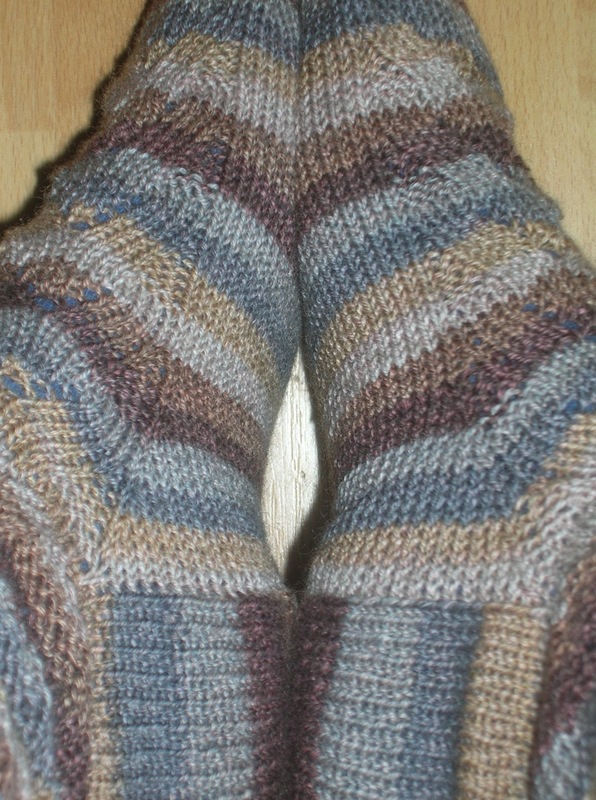 bought some yarn to make him the stripy socks he wanted. They are fairly dull but good train and TV knitting. However, as predicted they do seem to be going on forever. I can never quite believe how big men's feet are and spent a lot of the time grabbing C's foot in the knitting equivalent of "are we nearly there yet?". I've finally turned the heel but they may end up as trainer liners as I don't know that there's all that much yarn left to do any leg. I strongly suspect that we will find them far too warm to be comfortable anyway, so it probably doesn't matter. Today we have also been to JL in Reading and identified a cabled aran cardigan pattern which a) doesn't have to be ordered from the U.S. b) does not involve terrifying amounts of steeking and I might actually be able to knit c) (much to C's chargrin) doesn't have leather elbow patches, horn toggles, or cause the wearer to age by 40 years as soon as it is donned, so if we can agree on some yarn he may yet get the long-coveted cardigan too - possibly even before the end of the year. 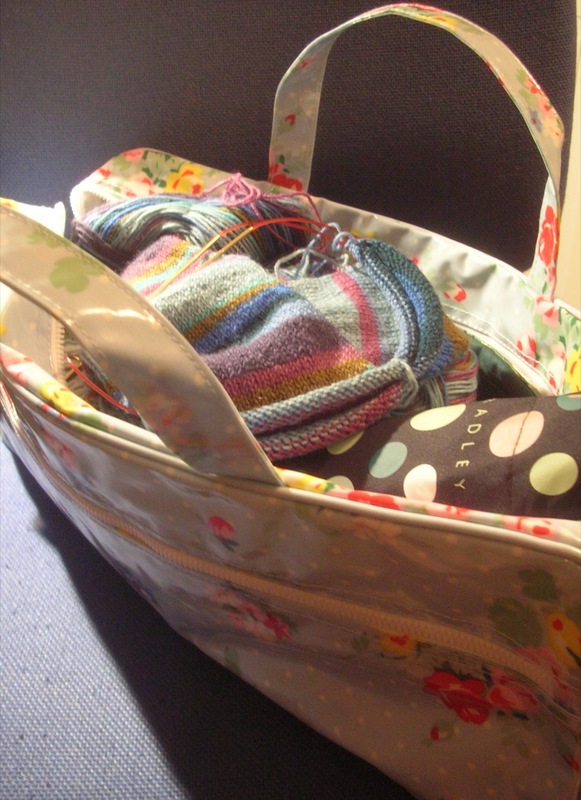 Star knitting-related present this year was this Cath Kidston knitting bag from the lovely mother-in-law. It's happily swallowed up the rather unwieldy collection of needles that's been preventing my stash box from shutting, thereby restoring marital harmony by allowing me to close the lid and put the box under the table out of sight. C also bought me the "New Pathways" sock book from Socktopus but (owing I suspect to Liz's dad snaffling the last available copy) it hasn't arrived yet - grrr. Is that a Radley umbrella in your knitting bag? Oooh, and happy new year! Yes it is. I don't usually keep it there but it was another part of the present. Sorry to hear of illness! I have also been consumed by some terrible lurgy of death. Isn't snot a passion-killer? My notions of a cosy little January love-in have all but been scuppered by my sniffy nose and hideous cough. But trust you to get knitting done in spite of illness! 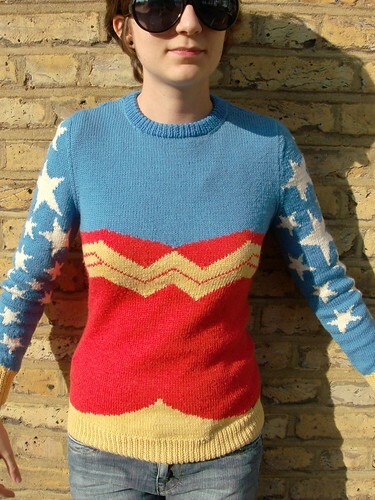 And so MUCH knitting, and so many lovely things. I love my stitch-markers, by the way. I am a huge fan of stitchmarkers and believe a girl can't have too many.